Come to Prague and experience one of the most beautiful examples of Belle Époque architecture in Central Europe. Together with the Hotel Savoy and the Hotel Palace, the new five star hotel “Le Palais” is now the third luxury hotel which is operated by Vienna International Hotels & Resorts in Prague. The historically accurate restoration of the original structure and the gentle weave of modern elements generate an unequalled ambience. 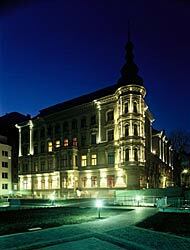 Large parts of the building were created by the Bohemian painter Ludek Marold and are therefore classified as historical monuments. The elegant and graceful lightness of the Prague Belle Époque style lends a unique atmosphere to the rooms and suites of the hotel “Le Palais” and will make your stay a very special experience. The hotel is a real treasure for sophisticated business and leisure travellers, for them to enjoy this delightful gem of 19th century architecture with its peaceful yet central location and to discover Prague at its best. The 60 spacious rooms and 12 suites with their elegant and friendly ambience and their luxurious, generous marble bathrooms offer first-class accommodation. The 12 suites have been lovingly restored and are furnished individually, true to style (some even with their own fireplace), with a splendid view of Prague. A unique 5 Bedrooms Royal Suite provides the utmost privacy and luxury. Privately closed area combine up to 4 Deluxe rooms with the Belle Époque Suite featuring original fresco and private fireplace. All rooms are provided with the most modern equipment which has been carefully integrated to preserve the ambience and the style of the 19th century: Air-conditioning, direct-dialing phone, PC connection, TV, DVD player and safe. 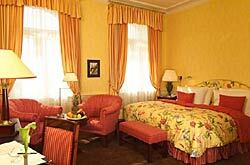 Minibar, tea and coffee service are included in the price.